Entering this season, Pitt women’s club lacrosse head coach Gary Neft figured his team wouldn’t be as good as last year’s. The man who has led the program for 18 seasons had good reason for thinking so. It’d be hard for any team to follow the standard set by the 2013-2014 Panthers, considering they won the program’s first national championship and lost just one of 21 games played. Remove the 11 of 12 departing starters from that lineup, and matching the previous year’s effort becomes even more unlikely. Indeed, the 2014-2015 Panthers (16-5) failed to repeat as Women’s Collegiate Lacrosse Associates (WCLA) National Champions in Virginia Beach, Va. this past weekend, losing in the quarterfinals and going 2-2 overall. While they fell short of retaining the title of America’s best, they went undefeated in league play, won regionals, qualified for the 16-team national tournament as the sixth seed and finished the year ranked No. 7 overall. All of this success came with a roster consisting of 14 freshmen, seven sophomores and just seven upperclassmen. “We definitely overachieved this year,” Neft said. Junior midfielder Anna Studenmund agreed. “We had a far better season than we could’ve ever imagined,” Studenmund said. A large key to exceeding their own expectations was integrating youth into games. Usually, Neft likes to ease freshmen into the college game, given how big of an increase in the level of play it is from the high school level, even for the most talented players. As a result, they rarely start right away. Neft said the last time a freshman started consistently was four seasons ago, last year’s graduating class’ first season. From the beginning to the end of this campaign, at least three or four freshmen, sometimes more, took the field as starters each game out of necessity. Also contributing to the squad’s depth were those who had played reserve roles last season. The then-veterans made their future replacements better every time they faced each other in practice. The extent of this effect went unnoticed until this year, though, according to Neft. What resulted was a balance that was present for much of the season, as seven players finished the season with more than 40 points (goals or assists). Studenmund credits this balance with allowing the team to have the success that it did. Opponents keying on one player, she said, didn’t stop the offense because someone else would step up. In its first game of the tournament on Thursday, Pitt played No. 11 seed University of Delaware and won 14-9. Eight different players scored, and a trio split the assists. Pitt would have multiple scorers and assisters continue in its next three games as well. In the quarterfinal the next day against No. 4 Texas, Pitt held a 6-4 halftime advantage, but lost, 11-9. With the loss, Pitt dropped into the consolation bracket, where it would lose to Colorado-Boulder, 10-9, on a buzzer beater in double overtime. In its final game of the weekend, Pitt avenged an early season loss to Santa Clara, defeating the No. 1 seed 14-11 to secure seventh place, the program’s third highest-ever finish. 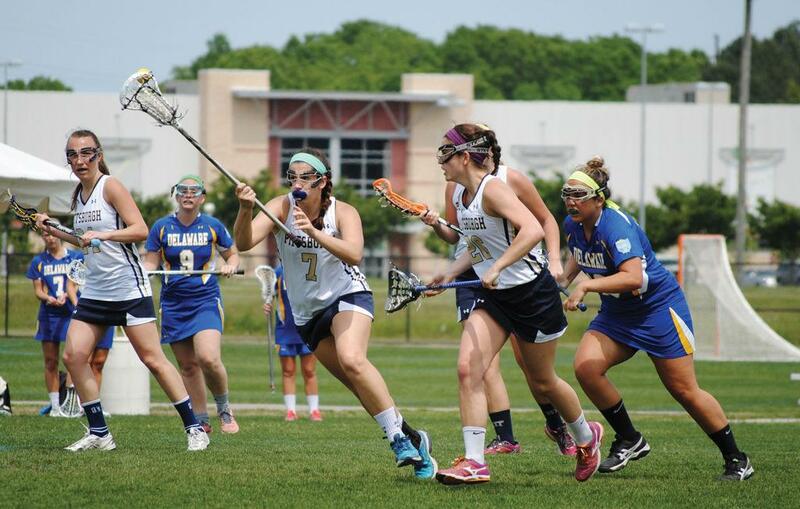 Paul Ohanian, who covers the WCLA tournament for Lacrosse Magazine, saw portions of the Panthers’ games over the weekend and much of their title run last year. He said one takeaway from watching them was the team’s ball movement. According to Studenmund, the team’s play during its fall season was shaky, but the team improved its chemistry before the regular season began in February by hanging out as a unit as often as possible off the field. “So when the spring season started up, the team definitely did click really fast,” she said. In early April, Pitt gave then No. 1 Michigan, and eventual national champion, its only loss of the season. Those expectations shouldn’t dwindle any time soon, because according to Ohanian, this team isn’t in danger of falling off in the near future, with the team only losing three seniors from this year’s roster.